The Bible says that in the beginning God created the heavens, and the earth, and everything in it; and He said “It was good” (Genesis 1&2). But because of the sin of the First Adam (in the Garden of Eden, Gen. 3), all of mankind became a byproduct of the fallen nature of man. This means, all have inherited Adam’s sin, and are in need of a Savior, to be saved from their sins. Because of sin, we now experience the fallout, which includes but is not limited to, sickness, disease, famine, crime, evil, and eventually death. But what happens when we die? The Bible says that we will be judged by God, “And as it is appointed unto men once to die, but after this the judgment” (Heb 9:27); and we will have to give an account for every thought, deed, and sin. We won’t be judged on a curve system, or a sliding scale. We won’t be compared to men like Charles Manson or the like. We will be compared to Gods standard, in short; the Ten Commandments. Thou shalt have no other gods before me: Anything that you have more time for, passion for, or knowledge of, than God and His Word; is a false God. Thou shalt not make unto thee any graven image, or any likeness of any thing that is in heaven above, or that is in the earth beneath, or that is in the water under the earth: God is a jealous God, and bowing down (even in thought) before anything angers Him. Idolatry does not have to be a golden calf, or a religious statue. It could be simple things like sports, our iPhones, or our iPad. Or our spouse, children or grandchildren, or any religion. It could even be believing in a Jesus that is not the Jesus of the Scriptures (2 Cor 11:4), by forming a Jesus into a figment of your own imagination, rather than submitting to the image of Jesus, as the Christ; according to the Scriptures. Thou shalt not take the name of the Lord thy God in vain; for the Lord will not hold him guiltless that taketh his name in vain: Using God’s name as a curse word, or inappropriately is blasphemy. Remember the Sabbath day, to keep it holy: One day out of the week is to be totally set apart for the things of the Lord. Thou shalt not kill (murder): This would include abortion. Jesus, however, rose the standard of this Law. Jesus said “That whosoever is angry with his brother without a cause shall be in danger of the judgment:” If you’ve hated anyone unjustly, you’ve committed murder in your heart, and you’re in danger of hellfire (Matt 5:22). Thou shalt not commit adultery: Jesus rose the bar here too. He said “But I say unto you, that whosoever looketh on a woman to lust after her hath committed adultery with her already in his heart” (Matt 5:28). Thou shalt not steal: Regardless of its monetary value, any form of theft is a sin against the Lord. Thou shalt not bear false witness against thy neighbour: Jesus said “But the fearful, and unbelieving, and the abominable, and murderers, and whoremongers (fornicators), and sorcerers (witchcraft & drug use), and idolaters, and all liars, shall have their part in the lake which burneth with fire and brimstone: which is the second death” (Rev 21:8). Thou shalt not covet: It is a sin to desire anything that belongs to someone else (either their property or spouse). Regretfully I’ve broken every commandment. Perhaps you think you’ve only broken some of God’s Law. The Bible says “For whosoever shall keep the whole law, and yet offend in one point, he is guilty of all (James 2:10). All it takes is just one sin to condemn us into hellfire, where we will be under the wrath of God for ever. The Bible says that “all have sinned and fallen short of God’s glory, and there is none righteous not even one, and the wages of our sin will be death. That we are already condemned, therefore the wrath of God abides upon us” (Rom 3:10,23, 6:23, John 3). The Bible says that every person is born ‘dead in our trespasses and sins,’ that we are all ‘sons of disobedience,’ and by nature we are all ‘children of wrath’ (Eph 2). That our hearts are deceitful, wicked, and evil (Gen 6:5, 8:21, Jer 17:9). Remember that I said we were all born into sin because of the first Adam? That is why we must be born again (born twice) by the Last Adam, which is Jesus Christ (Rom 5:12). In summarization. God is good, and we are not, we are all inherently wicked by nature. We have all sinned against a holy God, and we need to be saved from our sins (aka salvation.) Because God is just, righteous, and holy, He cannot allow sin to go unpunished, and He will not allow the unrighteous to enter heaven. Most people today, even some ‘professing’ Christians are deceived. The Bibles warns, “Do you not know that the unrighteous will not inherit the kingdom of God? Do not be deceived. Neither fornicators, nor idolaters, nor adulterers, nor homosexuals, nor sodomites, nor thieves, nor covetous, nor drunkards, nor revilers, nor extortioners will inherit the kingdom of God” (1 Cor 6:9-10). Now here comes the glorious Gospel. The Gospel means ‘good news,’ and the good news is this, God sent a remedy for our sin problem. God came to us in the form of a man, Jesus Christ, who was fully God yet fully man was conceived of the Holy Spirit, born of the virgin birth. Jesus was then horrendously beaten, and nailed to that bloody Cross. But this story about Jesus on the cross is more than a romanticized love story. Jesus Christ who knew no sin, became sin, as He atoned for the sins of those whom would repent and believe (His church). He was buried, and on the third day He rose from His grave. He then ascended into heaven where He is sitting at the right hand of the Father, where He will intercede on your behalf, if you become born-again. Through His death, burial and resurrection, on behalf of His Church, Jesus forever conquered sin and defeated death. Christ will return again where He will judge both the living and the dead. For those who are saved, He will raise from the grave to be with the Lord in heaven, and those not saved He will cast into hellfire. Now let’s zoom-in on the Cross. This is an amazing love for His Church. I became saved because Jesus justified me before the Father. Justification is a legal term, with forensic value. My sins were imputed over to Christ, and His righteousness was imputed over to my account. He became the propitiation for my sins, as He fully appeased the wrath of God, as He bore the wrath that I deserve, the wrath I would have experienced, had Christ not saved me. Christ paid my sin debt. Christ declared me (a sinner) righteous before the Father. I was guilty of sin, but Jesus was punished and executed, as if He had sinned. This is also known as the Imputation of Christ, and the Substitutionary Atonement. Perhaps this might happen to you, if the Lord grants you repentance, and bestows His salvation to you. The same God that is infinite in love, is also infinite in anger and wrath. The following verse is for Christians only. “But God commendeth his love toward us, in that, while we were yet sinners, Christ died for us” (Rom 5:8). But on the contrary, “God judgeth the righteous, and God is angry with the wicked every day” (Psalm 7:11). “The foolish shall not stand in thy sight: thou hatest all workers of iniquity” (Psalm 5:5). Which attribute of God will you come to know? Please understand that an ‘intellectual belief’ is not salvific. The Bible says “For God so loved the world, that he gave his only begotten Son, that whosoever believeth in him should not perish, but have everlasting life (John 3:16). And that “He that believeth on the Son hath everlasting life: and he that believeth not the Son shall not see life; but the wrath of God abideth on him” (John 3:36). This word ‘believe’ in the Greek means to be ‘entrusted to, and committed to Christ.’ Jesus forewarned that “many” believers (false converts) will be turned away by the Lord (Matt 7:21-23). You might ask “Is there anything I can do to earn my way to heaven, or to merit a good standing with God?” The answer is ‘no.’ “For by grace are ye saved through faith; and that not of yourselves: it is the gift of God: Not of works, lest any man should boast” (Eph 2:8-9). Albeit the Lord did say this, “The time is fulfilled, and the kingdom of God is at hand: repent ye, and believe the gospel” (Mark 1:15). And the times of this ignorance God winked at; but now commandeth all men every where to repent” (Acts 17:30). He warned, I tell you, Nay: but, except ye repent, ye shall all likewise perish” (Luke 13:3). Repentance is not the cause of salvation, repentance is because of salvation. A sinner is not saved by works, but they are saved onto good works. He said, “For this is the love of God, that we keep his commandments,” and His commandments will not be burdensome (1 John 5:3). He also said, “If any man will come after me, let him deny himself, and take up his cross, and follow me. For whosoever will save his life shall lose it: and whosoever will lose his life for my sake shall find it” (Matt 16:24-25). “And to you who are troubled rest with us, when the Lord Jesus shall be revealed from heaven with his mighty angels, in flaming fire taking vengeance on them that know not God, and that obey not the gospel of our Lord Jesus Christ:” (2 Thess 1:7-9). I’m compelling you to respond to the Gospel. 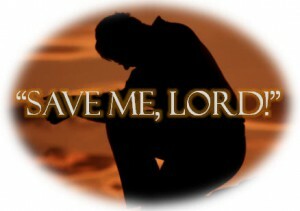 Call upon the name of the LORD Jesus to be saved, repent and put your faith and trust in Christ alone for salvation. Flee from your sin, and thrust yourself upon Christ for salvation; obey His Gospel. If the Lord saves you (or if you’re already saved), it is crucial to stay in fellowship with Bible obeying Christians, find a solid church, and subject yourself to Biblical discipleship.